At 52 Weeks of Peace we offer a full range of Yoga classes, including Integral Yoga. Integral Yoga is taught in the “traditional” style and incorporates all 8 of the yogic limbs, addressing “body, mind & spirit”. It is available for all ages, body types and physical conditions and has been established in the U.S. since the late 1960’s. Part of living a healthy, happy life is to live “consciously”. We make every effort to provide products that are supportive of “conscious living” in our retail store. When we live consciously we choose to use products whose production has not brought harm to people, animals or the environment. Such products should also bring into our own bodies positive and healing energy. Every effort is made to provide options for clothing, candles, incense, and skin, hair and bath products that are natural and toxin free. We also carry a wide assortment of books covering interfaith spirituality, inspirational self-help, vegetarian/vegan cooking, pregnancy and childbirth, holistic health treatment for common illnesses and disease, and more. Our counseling services utilize both East and West incorporating yoga therapy with traditionally accepted western therapeutic modalities. Counselors are fully licensed and experienced in both traditions. We offer a full range of counseling services from individual, couples, family and group. Another part of our mission is to provide a setting where people can come together, laugh, sing, and learn, as a community. 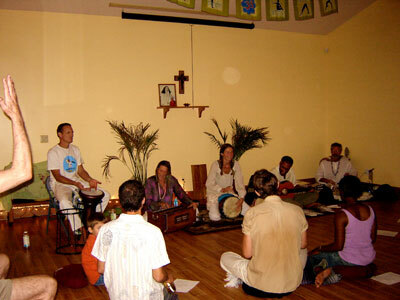 Our “Special Events” list Kirtans, Concerts, Health–Related Workshops and other special “happenings” such as “Open Mike Night” and “Movie of the Month”. All are welcome to attend and donations are happily applied to the rent!